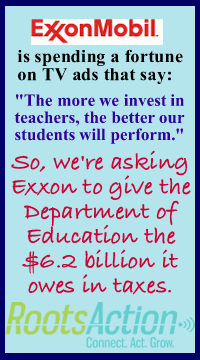 ExxonMobil, the most profitable corporation in the country, is spending some of its money on a series of television ads telling us to invest in education. Most of us don't have a lot of money to invest in education. Exxon does. In fact, if Exxon were to merely pay what it owes in taxes, the Department of Education could increase its budget 14 percent. Corporations are supposed to pay 35% income taxes. Exxon pays about half that. A report by Citizens for Tax Justice found that Exxon should have paid $4.1 billion more than it did between 2008 and 2010. Using the same calculation, we find that Exxon underpaid in 2011 by another $2.1 billion. As the Exxon ads keep saying: "Let's solve this!" Would you like to ad a note to be delivered to ExxonMobil? 17054 Fri Mar 15 14:59:42 EDT 2013 Kenneth Giles Monrovia, CA , US Can you imagine the promotional benefits of contributing to education and not looking like corporate deadbeats? Way to get on the right side of the debate! 17039 Sun Mar 03 14:34:57 EST 2013 Linda Hayes Brooklyn Center, MN , US Is it possible that you have overlooked your obligation to pay taxes on profits made in this country? 17036 Fri Mar 01 23:39:47 EST 2013 William Todd Strafford, NH , US Actions speak MUCH louder than ads. Take this one and I'll be legitimately impressed.